Uncategorized «Chess for Education Abroad, Inc. 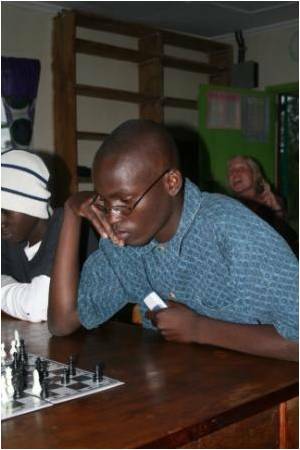 Chess for Education Abroad, Inc.
Below is an email I received that I was told I could share from the director of the Kakemer Resource Center in Kakemer, Western Kenya. For more picture an information of the KRC chess program you can read below. All the secondary school kids love coming and playing, we are now going to start a play off between the club members so we can build a first and second team to compete against schools in the area. Thanks for your encouragement – enjoy the photos! Diana, Supervisor at the Resource Centre, ensuring all players are enjoying the competition and keeping the score. First, second and third place (L to R) Collins, Edwin and Hellon. A young girl took 4th position (not photographed). 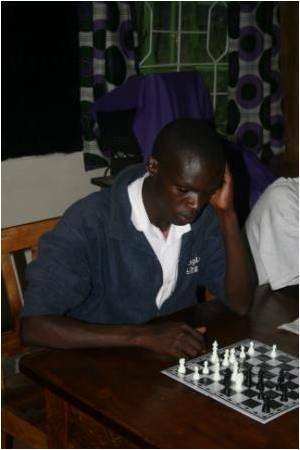 The winner of the tournament, Collins, is not from Kakemer, he came from Nairobi as he could not find work, and lives about 30 minutes from Kakemer but likes to come and play. He is by far the strongest player as he has been playing for 6 years. 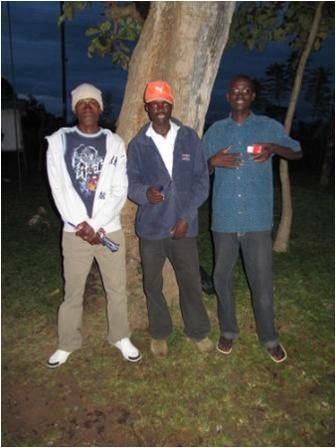 Whilst Erwin is a teacher at the Kakemer secondary school and Hellon is one of the teachers at the Resource Centre, and they came second and third respectively – but the students did not mind getting beaten by them – in fact it encouraged them to improve. The Chess club in SMA YPK in Bontang is going slowly, but is hopeful. In the week after my last email 50 students signed up for the chess club. Unfortunately as we started the first week of the club there was a lack of communication about times and i had to again announce the club in each of my classes. Only 2-6 students on average came. Compounding on this, after another week exams started and the semester ended. Classes, and with them the chess club, will not start again until Jan 4th. In order to organize everything better I plan on making a chess club Facebook page to send emails, reminders, updates, etc to everyone who signed up. With better communication and the next exams no where to be seen there should be more kids coming than I can handle. Also, while my school is having their vacation another high school in Bontang, SMA 2, isn’t. With two of the teachers I know there, Emma Sutton, another Fulbright English Teacher who was assigned to my town (or I to hers), and Edi Ruswanto, I will be starting up another chess club. We will have our first chess club meeting there this coming Monday the 14th. Chess for Education Abroad and Chess for Life in Bandung, Indonesia are officially partnering to help promote and establish both Western and Chinese Chess in Indonesia. Chess for Life (from a few articles ago) is a for profit chess school that tutors chess students in Java, Indonesia to become chess masters. C4L is a new organisation founded earlier this year in Bandung, Java. But they are already making plans to expand to other cities in Java and then throughout Indonesia. C4L’s for profit chess school will work perfectly in tandem with the CEAs non-profit mission. 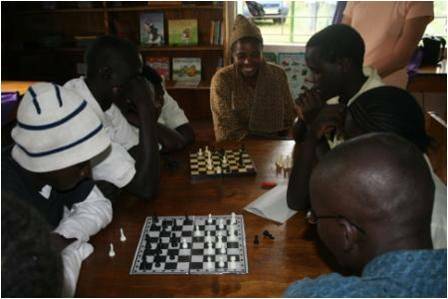 The CEA hopes to work with C4L in their partnership to identify and establish chess clubs in schools in rural and developing communities in the area with C4L tutors. In return the CEA is helping establish Chinese chess, or XiangQi, and, one day, Japanese Chess, or Shogi. Above – Peter Mallozzi and Paul Chiariello, CEA volunteers, are learning a little chess philosophy from one of Chess for Life’s nationally recognized chess instructors. Needless to say, he beat both of us in games. Of course I (on the right in green) got beaten pretty quickly. However, Peter (on the left in blue) had a 2 hour neck and neck game with another tutor at Chess for Life. In the end: America 1, Indonesia 1. Hopefully we’ll have a rematch one day. Paul Chiariello (far left) and Peter Mallozzi (far right) are both CEA volunteers, helping set up chess clubs in schools in Kalimantan (Borneo) and Java, respectively. Marulitua Manalu (center) is a tutor for Chess for Life and is deeply passionate about both chess and its ability to improve the lives and minds of students. I have a feeling it will be a very productive partnership!